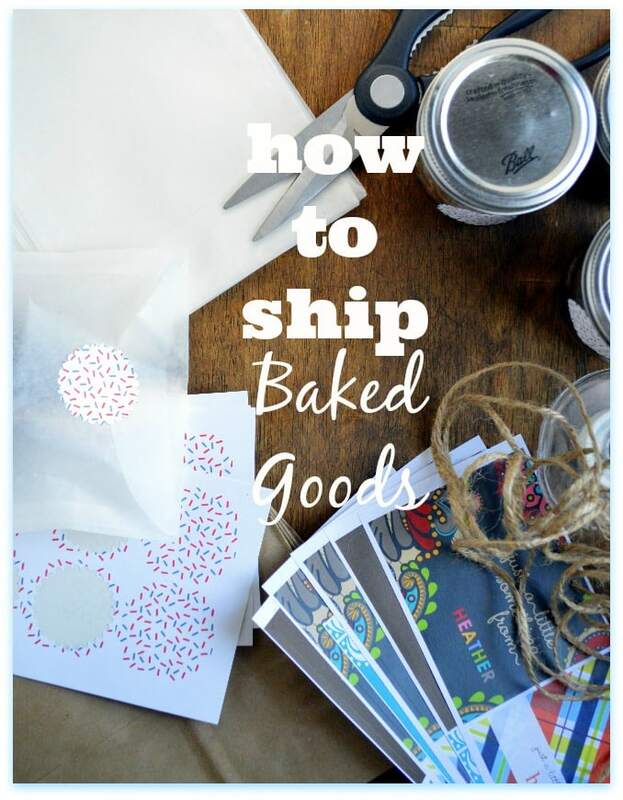 Super easy tips on How to Ship Baked Goods including money-saving postage options, and wrapping to keep your treats fresh and in tact! It’s May, which means that I have been participating in The Leftovers Club for one whole year. 12 months of swapping “leftover” treats (you guys know we never actually have leftovers around here, right?) with friends that I’ve found from coast to coast. It’s really fun and I always look forward to it — I mean, imagine if your favorite food blogger wrapped up those brownies you were drooling over and mailed them to you?! Here’s the thing though. 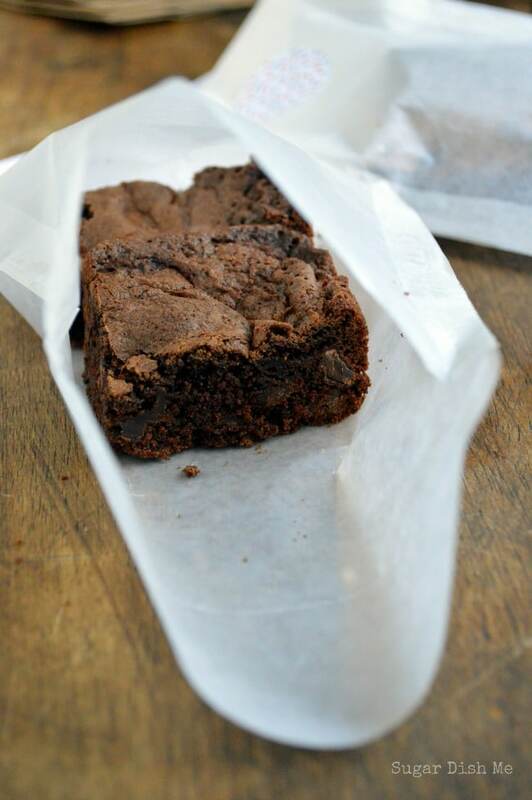 Sometimes awesome brownies do not hold up in the mail. Actually, LOTS of things don’t hold up in the mail. So after one year of hits and misses, stale treats, crumbled cookies, hockey pucks, and other assorted oddities that I know started out as THE MOST amazing foods, I decided to use my experience here (and shipping goodies retail) to break it all down for you (and if you have more tips, please leave them in the comments!). If you’ve never done this, I will totally vouch. IT WORKS!! I wrote a whole post on my results using white cake and some insanely delicious green frosting. Pictured here are brownies, from scratch, all baked and cooled and ready to eat right out of that jar. You will have to adjust your bake time (obviously), and then you will FREEZE whatever you’ve baked before shipping. I would not recommend this for long distances in the summer, but for 1-day mail in a moderate climate (or another bizarrely frigid winter) this solution is perfect! You can find the whole tutorial on shipping cupcakes on The Cupcake Project HERE. Plastic wrap is your friend. Tupperware is not. This is going to sound sort of counter-intuitive, but bear with me and I’ll explain. SAVE YOUR NICE PLASTIC CONTAINERS!! Here’s why: Plastic containers are basically air-tight. Which is perfect in your climate-controlled, humidity-free home. Especially when you open the container everyday to grab a cookie and the moisture has a chance to escape. But when you put that air-tight container in the mail and it isn’t opened for days, that moisture hangs around. If it’s too warm outside mold can happen. Once I got a very nice container full of sweet mushy goo that I think started out as bars of some kind. The photos were gorgeous! The recipe looked perfect! What came in the mail was not. Plastic wrap fastened with a pretty sticker is cheaper, cuter, and much more forgiving. PLUS it’s smaller to ship. Treat bags are soooooo cute. And I feel all professional whenever I deliver cookies or something tucked neatly into these little parchment envelopes. Bonus points for more stickers. I really dig a good ‘ol brown bag. You can stuff it full of so many things! 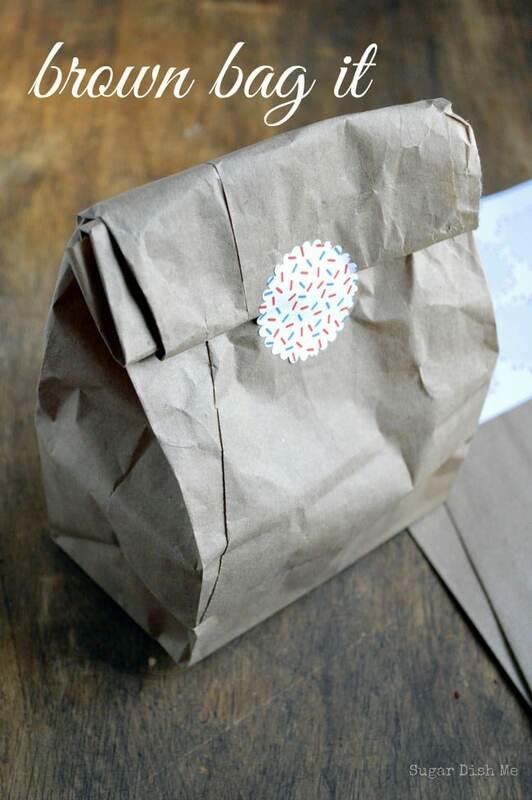 Cookies, brownies, bars, granola, loose nuts — you can brown bag ANYTHING. If you are shipping things that need to retain moisture, you probably want to wrap in plastic before brown bagging. This is how I deliver lots of things locally. Totally cheap and stylish, I think (but remember I live in jeans and tank tops, so you may not want to take my word on the stylish thing). Newspapers, plastic bags, construction paper — you need to FILL your box to capacity so that things don’t move around and get smooshed. Once I got some INCREDIBLE macarons in the mail, but they were all chipped and broken. I ate them anyway (oh yes I did) but I felt so sad for the maker because I know she poured some time and heart and soul into them. You can’t ever really guarantee that nothing will break, but you can do your best to try! And while we are talking about boxes — I need to tell you my secret. You can go to the USPS website and order boxes FOR FREE and have them delivered right to your door. It’s basically amazing. I ALWAYS opt for USPS Priority Mail 2-Day delivery. It’s a flat rate no matter how many loaves of banana bread you shove in that box. 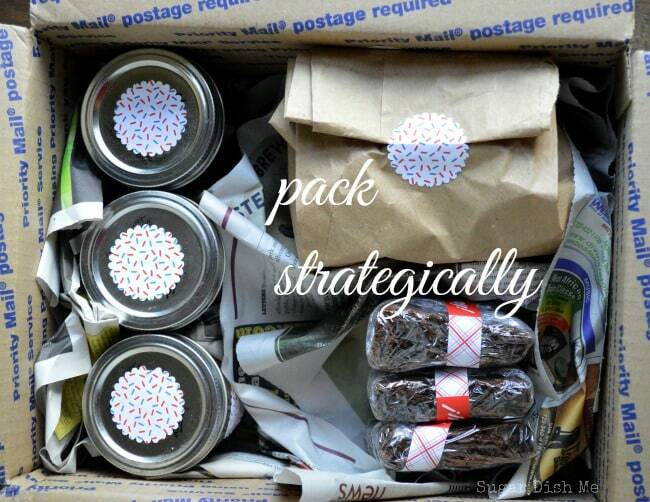 AND you know your goodies won’t be traveling for a week. A little bit of flair (37 pieces, to be exact) goes a long way. I love sparkles, confetti, raffia, paper grass — it all makes your gift feel like just a little MORE. I mean, if you are mailing muffins you can skip the wrapping paper, right? Personal labels are happy. If you have’em, use ’em. If you ship with USPS, you can not only use the flat rate 2-day FREE boxes, but you can also print your labels right from your computer and have the mailman pick the package up right off your porch! I do like to play around with the mailing options — some are cheaper than others. For example, a standard medium box to anywhere in the US is $11.30. But I’m in North Carolina and if I am shipping to other states on the east coast, a Regional Rate A box is almost EXACTLY the same size, but ships (any weight!) for around $5.60. The bottom line here though, is that you can handle all the mailing without leaving home! How easy would this be at Christmas?! Just saying. I typically schedule pickup the night before, bake either that night or in the morning, let everything cool completely, and have it picked up in the afternoon. 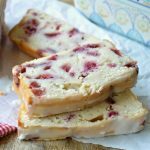 If you have tips for shipping baked goods I’d love to hear more from you! Thank you for sharing all of these tips!!! Love all your cute stickers and tape! 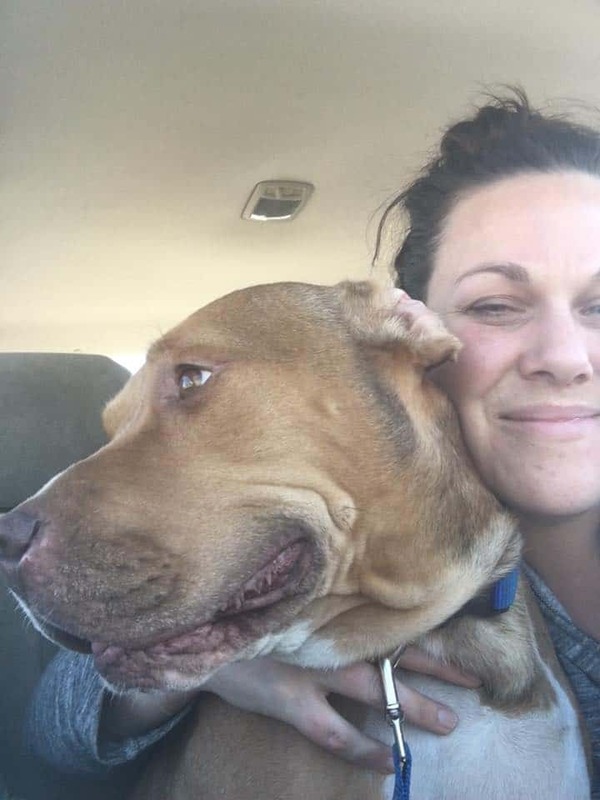 Great post, Heather! Shipping baked goods is always tricky. I always worry whether they are going to arrive the same way I shipped them. I’m definitely going to use these tips! Great tips. I think I will use these ideas for you know who leaving for school in a couple of months! Everything looks so pretty. Probably not necessary for him! 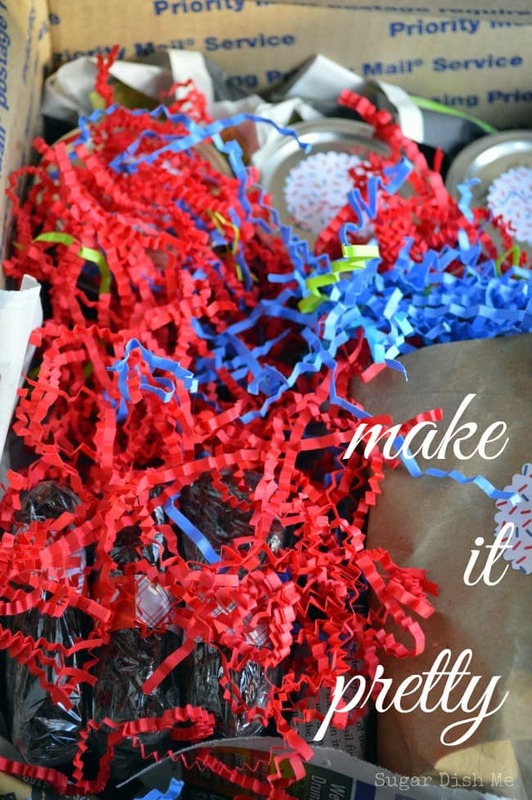 I love this post– I need to step up my game when shipping for the Leftovers Club! Great post! I ship cookies regularly to my son who’s at the US Naval Academy… 1500 miles away from me! When I ship cookies, I put two, back to back, and then wrap in plastic wrap, and finally, put the pairs of wrapped cookies in a Ziploc bag. Works great! Thanks for the post. I’m preparing to send my son a birthday care package. He’s overseas. God Bless. First, I’m terribly jealous of the recipient of that box! 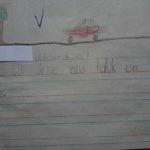 Second, such great tips – thank you! Totally agree on all the tips. Great post! I am so glad I came across this! My wife is away for military duty, so I’m always wanting to send her treats, but I have no clue how to ship them. Now I know! 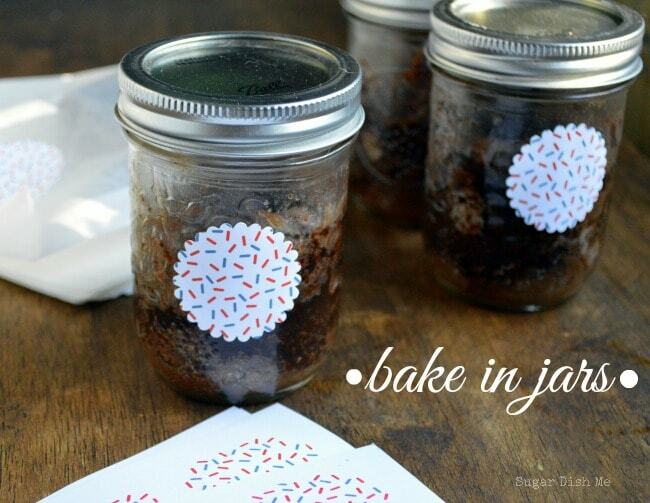 When you bake in jars, be sure to put the lid on the jar while it is still hot so the jar seals itself. If you do this, the contents can last much, much longer. I just shipped pumpkin muffins and brownies. I wrapped them all individually in saran wrap and put them in a plastic container. The only thing is that they were still warm. Will that be a problem? Hi Natalie! I think it’s so cold everywhere right now (you’re in the US, right?) that it should be totally fine. You have to be careful wrapping warm baked goods because the plastic traps all the moisture. I love wrapping quick breads that I’m not shipping that way. For the next time I’d probably let the muffins and brownies cool completely, then wrap in plastic. And I’d swap the plastic container for something like a gift bag or basket 🙂 The trick is to try to keep the baked goods moist and fresh while also preventing them from drying out or being exposed to the air. Hope that helps! Thank you for the quick response. 🙂 I am in the United States. I am shipping from Arizona to California, and they will be delivered on Monday. I wish that I had gotten them out on Wednesday, for a Friday delivery, and let them cool before shipping. I am hoping that because they are brownies and muffins, that they will still taste fresh by Monday. Next time, I will let them cool. They should still be okay for Monday, right? Thanks so much. I am sending these as a gift, so I just wanted to make sure they will be okay. Hey Natalie! Like I said — it is SO frigid everywhere right now I think they should be totally fine. Sometimes it’s hard to get the mail timing right! But I am sure your recipient will be so happy and I am pretty positive your treats will be A-OK. Thanks so much for reading and let me know if you have any other questions or tips! I’m sending a Christmas box of goodies for my son in Australia. Instead of frosting the sugar cookies I thought about putting the frosting in a separate mason jar and he can frost when they arrive…..do you think it will hold up? Are you shipping from the US to Australia? That’s a long way! If it were me I’d just frost the cookies, but if you’d like to package the frosting separately I think it will work fine. Put it in a mason jar like you said and then freeze it before sending. And let me know if it works! Have a happy holiday cookie sending season and thanks so much for reading! Hi Heather, I was wondering if glassine bags would work well? I am not sure what the difference between parchment paper and glassine is. I have a question. My son is stationed in Colorado, and I live in St Louis, MO. My mother and I both have mailed him homemade cookies and he said when he gets them they are white’ish (lighter in color) and not very good. He thinks it has something to do with the altitude. Do you know anything about that? Hi, thanks for sharing the tips about shipping. But I have a question. I also live in NC and lije to know how did you ship medium size box for $5.60? What was uour trick?? Love to know that. Hi Ana! There are 2 options with USPS, but you have to look for them. When you go online to usps.com to print your shipping labels, switch from flat rate shipping to enter a package weight (I just guesstimate the weight). You’re looking for Regional Box A or Regional Box B. One of my local post offices carries the Regional A boxes in the store, but the other does not, so I just order the boxes from the website and keep them here. They are free!! Great guide! Glad my technique works for you! Love it, Stef! Thank you! I’m getting into sending baked goods to friends and relatives who live far away. Thanks for all the wonderful advice! I couldn’t have hoped for a more comprehensive resource!! I’m so glad this was helpful for you, Andrea! Happy baking! Great post. I am trying to send some baked goods to my friend who is in South Korea and it will take 6-10 days I think to get there. I was wondering if you thought bars would travel better than cookies, and would you put them in a plastic bag? I was thinking about freezing them, and basically letting them defrost on their trip. Any thoughts as to if this is a good or bad idea? Hi Robyn!! My experience with international shipping has only ever been to England, so with someplace like Soth Korea make sure you account for both the time and the climate difference. I think cookies or bars would both do well. A plastic bag is probably a good idea as long as there isn’t TOO much moisture. I’d say most traditional brown sugar bases, oatmeal cookies, chocolate chip, blondies — all should be fine. But something ultra soft like a cake mix cookie or Lofthouse style sugar cookies, or even cookies/bars baked with fresh fruit (instead of dried) — I’d be worried about how they hold up. Freezing works, but it’s better for overnight I think (just based on my experience). I’d just cool to room temperature, wrap, and ship! Hope that helps! My family lives far from me…and I am always looking for ideas and suggestions regarding sending baked goods. Thank you for all your suggestions…and commonsense! You have made this Christmas season much easier! I know this is an old post, but still helpful. I just have to say I used to ship cookies to my husband from Canada to the US before we were married. And I just packed them in a tupperware container and mailed that. Didn’t need the box at all, I don’t know if we had free boxes though. P.s: i’m not gonna fry them, just gonna bake it. i just used the name because it has the same recipe but not the procedure 🙂 thank you! Good luck! And Happy Projecting! how bout pancakes? do they ship well too? How bout donuts with glaze? Do they ship well? Hey Kyle! It would depend on how you are shipping them! Are you making them yourself? Wondering the same thing about donuts! I’m wanting to send a military friend his favorite donuts (glazed krispy crème donuts). I’m wondering if just doing the same plastic wrap and brown bag it would work? Hi Hannah! That is so nice of you! Are they going overseas or will they still be in the US? My best friend lives in England and I live in Connecticut. She’s going through a rough time right now and when she was around, I used to bake her chocolate chip cookies or blueberry muffins at times like this. I was wondering what you think would hold up best with the weeklong shipping time though. Thanks! Hey Kris! I also have a friend in England! Cookies and muffins should both ship well – especially this time of year. Merci beaucoup ! Depuis le temps que je cherchais un article comme le vôtre ! Merci encore pour le partage ! Hey Heather, I live in California and I’m planning on shipping brownies, granola bars, apple pie-in-a-jars, and some chocolate chip cookies to 4 good friends of mine down in Alabama. I’m planning to bake, wrap, and mail everything in 1 day for no time waste. They’re all roommates and one is planning to move out in two weeks. Do you have any tips on helping me make these goodies survive through the mail? Thanks! First of all, this post is so incredibly helpful. Baked goods are part of a package I did for my kickstarter, so I will use this immediately. Could I ask where you got your stickers from? Hi Natalie!! 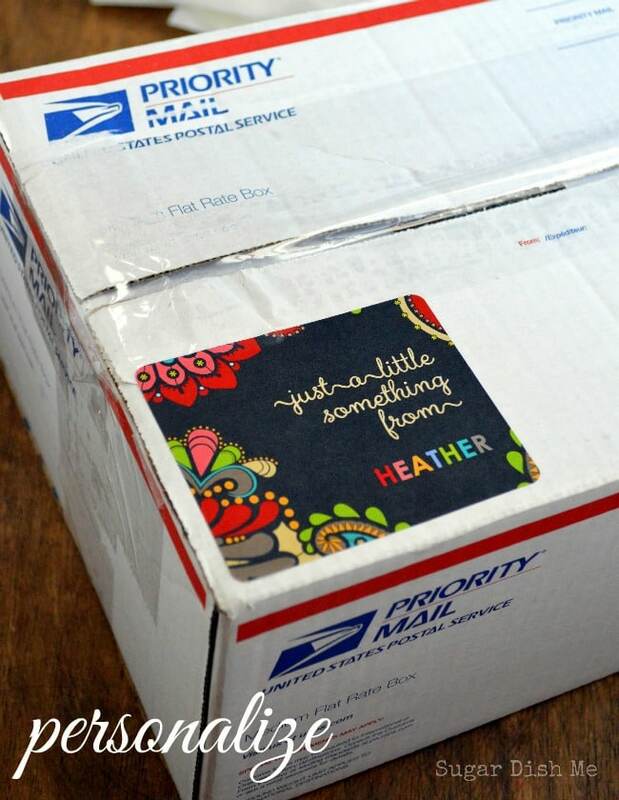 The stickers in this post came from minted.com but there are lots of places you can order them a little cheaper. I’d check amazon 1st! Also places like vistaprint etc. Hey Marla!! I think a lemon butter loaf would work great! Banana bread will depend on the moisture content. Sugar cookies, coffee cakes — all good things to mail in the summer months. So glad this was helpful for you! Hi! So glad I came across this post. I just have a quick question… I’m considering making a quickbread with blueberry beer and shipping it from Virginia to Arizona (where it’s currently in the 110’s every day). Does this sound like a horrible idea? Should I wait for things to cool down a bit first? I have no idea how the beer will react will react to the heat, if at all (I know the alcohol mostly bakes out, but still…) Anyway, I appreciate any advice you may have. Hi Pam!! I’d say definitely ship using Priority Mail so you are guaranteed 1-2 day delivery. Loosely wrap in bakery paper (parchment) And then slide it into a bread bag — a plastic bag like what your storebought loaves come in at the store. Secure with a twist tie. This should seal in the moisture without promoting mold or anything from too much moisture. The bread sounds delicious!! Hope this is helpful! Hi there! I’m wanting to send my boyfriend some blueberry muffins while he is deployed in the middle east. It’s around 135 degrees there now. Are these good to send there? And if so, exactly how should I package them? I should also mention, the last 2 packages I’ve sent took 11 days to be delivered. Hi Kadi! So this is probably not the answer you want, but I can’t think of any blueberry muffins that still taste great after 11 days. If that’s not a concern then I can give you some tips on trying it. I’d DEFINITELY start by using a muffin recipe that calls for canned blueberries. I’d bake in the morning, cool completely, package, and ship the same day. I think because of the heat and the moisture content of muffins, I’d wrap them in parchment and NOT plastic. 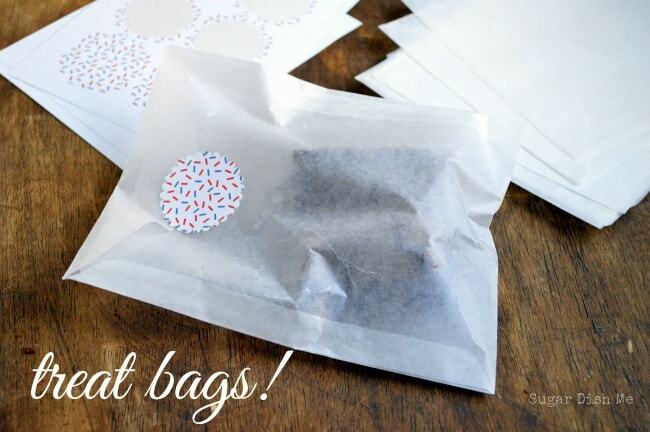 You can try parchment envelopes or parchment paper with baker’s tape. Smaller muffins will dry out faster so go with standard or jumbo muffins. If I’ve spooked you on the muffins you may want to try something more forgiving in the heat –= like shortbread. I hope this helps and I’m haoppy to answer any further questions! yes they will be! 🙂 Happy baking! I want to mail Madeleine’s to PA from CA. Can I bake them, cool and freeze them before mailing them priority mail in 1-2 days time? Please reply. Hi Sherry! Yes you absolutely can! For Madeleine’s though… you probably don’t even need to freeze them. Just let them cool completely and wrap them in something that will help retain moisture but won’t SEAL it in all crazy airtight. Think like the parchment bakery sleeves or even the little plastic treat bags, with the top folded and sealed with a sticker. Great ideas. My Grandma has always sent us Christmas cookies all the way across the country each year and I am considering starting the same tradition or some other treat for my in-laws and their two kids. My Grandmother always used cookie tins with wax paper between the layers of cookies with good results, although sometimes there are some broken cookies. I love the idea of the flat rate box dropped off and picked up at my own home, that sounds like a great way to avoid the post office lines! Grandmas with wax paper and tins knew how to do it right! Thanks so much, Emilia! I know this is an old post, but still helpful. I just have to say I used to ship cookies to my from from UK to the US before we were married. And I just packed them in a tupperware container and mailed that. Didn’t need the box at all, I don’t know if we had free boxes though. I like that you said that plastic containers are basically air tight. Recently my wife was wondering about shipping treats to people. Now that I know this I might need to share this with her. It might be good to note what kind of food it is that is being shipped also. I am planning to put up a business that involves shipping out baked goods (specifically Mexican style sweet breads), any suggestion/s on the best way to ship them around the US? Thank you for all this amazing information! How would you recommend I wrap an Irish Soda Bread. It is a slightly sweet version with some raisons. I live in PA and will be shipping one to my Dad in NY and one to my Mother-in-law, further north in NY. Hi- how can I overnight Apple crisp (location is 2 hrs from my house)? Freeze it first? Hi Heather! I recivied a request for some of my apple crisp from my brother-in-law for Christmas. I was wondering if it would hold up being shipped. I would be shipping it to Buffalo N.Y. and i’m in va? Thanks in advance for a reply. Hi Everyone! I want to send baked goods from Canada to my friend for the holidays, who is deployed in Iraq until spring. Can I do this the same way? Heather, I just started shipping baked goods in the past 6 months for the first time. So far everything seems to have gotten to their destination in good shape & still tasty. However, this will be the first time I ship in this extreme heat we are having & I’m shipping to the south. My thought was to drop at post office as close to cut off at 5:00 as possible using priority mail. Since I’m not paying for weight was wondering about putting freezer pack in with the muffins I’m sending. I know it will be defrosted way before it arrives but thought it might buy me a 1/2 day of being less exposed to the heat. The packs I have are a better quality, longer lasting than some of them on the market. Thoughts? I think this sounds like a great plan! Priority mail should be 1-2 days. So that + a freezer / dry ice pack and you should be good to go! Hi Heather! Thank you so much for the information. I sent my boyfriend some cookies from Illinois to California two months ago and by the time he got them, 3 days later, the breakfast cookies, which were made with bananas Had mold on them! I had packed them in the air tight plastic container that you were talking about and because of the humidity, the long trip, fluctuation and the temperatures and the container I now know is why they molded! I was so sad and embarrassed when he sent me the picture. I am going to try this again but minus the bananas! This time I’m going to try wrapping them and parchment paper or even plastic wrap! Hello! I know this is an old post but would love some advice. My boyfriend has to go back to his home state across the country for a couple months and I wanted to surprise him while he’s out there with some brownie cookies (brookies) or stuffed brownies that have oreos or reese’s pb cups. After reading your post and comments I had a question on whether or not you recommend parchment paper bags over plastic wrap. I love the cute detail the parchment bag gives but worry about the lack of moisture retention. Also, if the stuffed component will affect how well it holds up. Also, thank you for your tips on the free boxes and flat rate shipping. Just ordered my free boxes! Hi April! 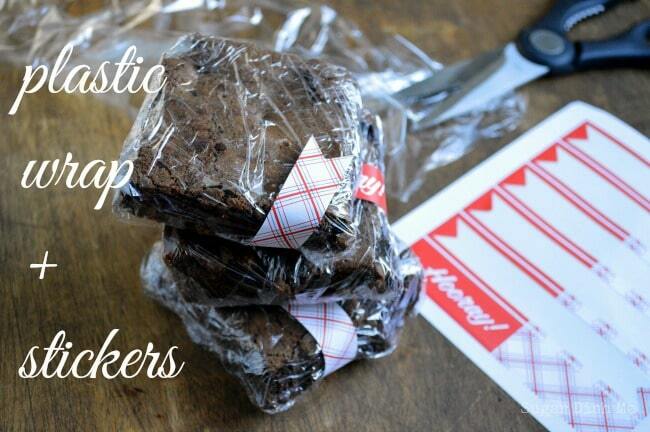 For these types of brownies I think you can make the call when you bake, cool, and slice. If they seem really gummy/extra moist as some stuffed or more fudgey brownies can be I’d go with the parchment envelopes. I agree they are more fun! If you are concerned that there might be a chance that things will dry out go with the plastic wrap. The most important considerations will be the weather where you are / where you are shipping to, and if you are able to get that 2-day priority shipping! If it’s hot/humid where your package is headed, parchment is a safer bet. Cold? Plastic wrap. Sending to Kosovo and to Afghanistan, and hoping to send funfetti cookies, favorites. Since they are a cake mix cookie, I normally try to keep them fresh by placing a slice of bread in the plastic bag with them. Good idea? Bad idea? Dumbest thing you ever heard? That’s actually an amazing idea! Let us know how it works for you! If it’s a solid tip I’d love to add it to this post! Hi! Great post! I am trying to mail some macarons to my boyfriend’s family for Christmas. I’m planning to mail them a few days before Christmas to ensure that it gets to them in a timely manner, but I still am not sure how I should package them to maintain freshness. I’ve read posts about wrapping them individually in a plastic bag and then taping it to a piece of cardboard, and then wrapping it with bubble wrap. I’ve also read things about storing them in an air tight jar and I’ve seen people put them in a box and also include an ice pack. There are so many different methods, that I’m not really sure what is the right one. I would love to know if you have any strategies on how to pack and prepare for them for shipping, while also maintaining a bit of appeal. All of this information is awesome! I have read all of the comments as well. 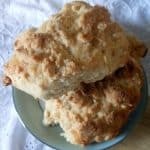 I need advice about yeast rolls. We are in Virginia, want to ship to Texas to the Army base for my step son. Because they are yeast rolls, I am not sure about the best packaging. The weather is warm in Texas right now, between 60 and 70, and cold in Virginia. Any advice would be appreciated! Hi Cindi! I’d ship these the way your bread is shipped; wrapped in a plastic bag that’s tied, but not airtight. Wrap the bread AFTER it cools completely, and aim for overnight, 2 day shipping at the most! These images look so amazing and thanks for sharing these wonderful ideas with us. I really appreciate your work and good Luck for more amazing work in the future.